President Barack Obama gestures while speaking at Argonne National Laboratory in Argonne, Ill., Friday, March 15, 2013. Obama traveled to the Chicago area to deliver a speech to promote his energy policies. Environmentalists gather outside Argonne National Laboratory, where President Barack Obama was giving an energy policy address, to protest the Keystone XL pipeline project. 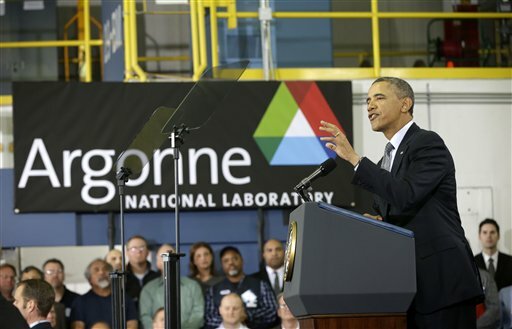 President Barack Obama visited Argonne National Laboratory Friday (full text of his speech here) to tour its research facilities and call on Congress to flag oil and gas money for research that could help wean the nation’s vehicles off oil. The idea is a clearer vision of the Energy Security Trust he outlined in his most recent State of the Union address. Obama proposed diverting $2 billion over 10 years from oil and gas leases on federal land to pay for clean fuel research. Citing an Environmental Protection Agency report released Friday, Obama recounted recent gains in fuel efficiency. The President responded to recent price spikes at the gas pump, touting a jump in fuel-economy standards under his administration and a downward trend in CO2 emissions from vehicles since 2005. Argonne is a major research center for fuel efficiency and advanced batteries. The Department of Energy recently named the lab a national hub for advanced energy storage technology. Though the Energy Security Trust idea was hatched from a bipartisan team with support from business leaders, its passage through Congress remains uncertain. Securing America’s Future Energy, the group that drafted the policy report, notes that federal funding for energy technology research and development in 2012 was less than half what it was in the late 1970s. The plan attempts to bridge a political gap between Obama’s professed “all-of-the-above” energy policy, which involves ramping up fossil fuel production, and environmentalists who expect decisive action on climate change. In lieu of comprehensive legislation to curb carbon dioxide emissions, Obama positioned the Trust as part of his economic strategy. It could also potentially supplement clean energy research currently suffering from the expiration of stimulus funds and the mandatory spending cuts known as the sequester. Obama addressed the effects of the sequester on basic scientific research. He joked that the sweeping budget cuts could be to blame for a lack of chairs in the audience, but also said the cuts “don’t trim the fat; they cut into muscle and into bone.” This week Eric Isaacs, Argonne’s director, co-authored an article in The Atlantic decrying deep cuts that he said would cancel all new research initiatives for at least two years. “In a time where every month you’ve got to replace your smartphone, imagine what that means when China, Germany and Japan are pumping up basic research and we’re just sitting there doing nothing,” Obama said Friday. 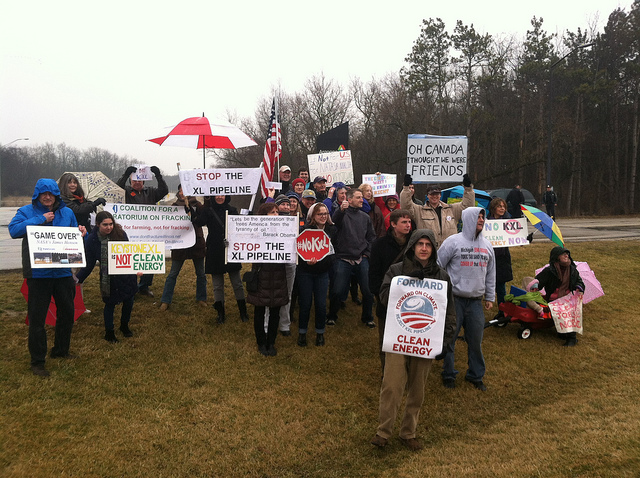 Environmentalists also traveled to southwest suburban Lemont to protest the controversial Keystone XL pipeline. The polarizing fossil fuel project did not come up during the President’s address.